A 41-year-old man and his 6-year-old daughter died Aug. 3 when a severe storm knocked down a circus tent on the Lancaster fairgrounds. Investigators inspect the site of a circus tent that collapsed Monday during a show by the Walker Brothers International Circus at the Lancaster Fair grounds in Lancaster, New Hampshire, on Tuesday, Aug. 4, 2015. A quick-moving storm with 60 mph winds hit the tent shortly after the show started killing a father and daughter. 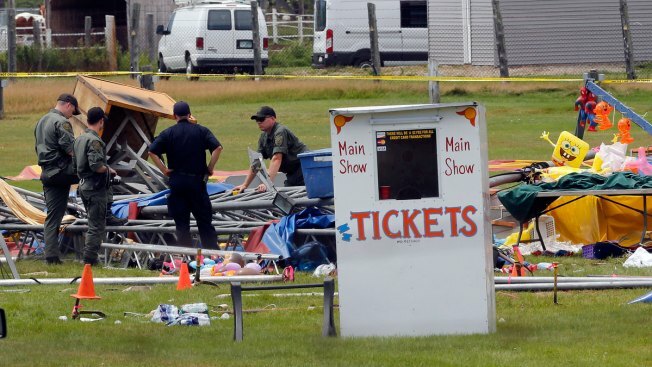 Federal safety officials have proposed more than $33,000 in fines against a Florida-based circus operator for a tent collapse that killed two people and injured dozens in New Hampshire. A 41-year-old man and his 6-year-old daughter died Aug. 3 when a severe storm knocked down a circus tent on the Lancaster fairgrounds. Both victims were from Concord, Vermont. The Occupational Safety and Health Administration said Thursday that Sarasota-based Walker International Events failed to properly erect the tent and ignored severe weather and high-wind warnings from the National Weather Service. OSHA says it also found hazards that put circus employees at risk of electric shock, burns and cuts. The company has 15 days to respond and challenge the proposal. A phone number for the company was out of service Thursday.